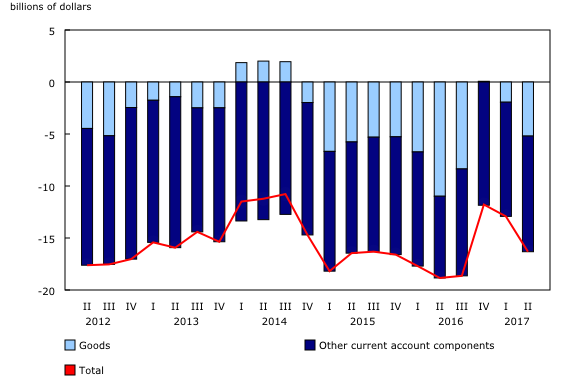 Canada's current account deficit (on a seasonally adjusted basis) widened by $3.4 billion in the second quarter to $16.3 billion, as the deficit on international trade in goods expanded. 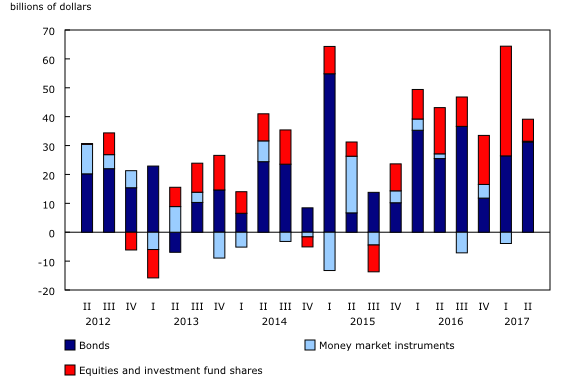 In the financial account (unadjusted for seasonal variation), foreign investment in Canadian bonds was the largest contributor to the net inflow of funds in the economy. The deficit on international trade in goods expanded $3.3 billion to reach $5.2 billion in the second quarter, as imports advanced by more than exports. This followed a $2.0 billion deterioration of the goods balance in the first quarter. On a geographical basis, the goods deficit with non-US countries was up $1.8 billion, mainly reflecting a higher deficit with China. Meanwhile, the surplus with the United States was reduced $1.5 billion to $10.4 billion after three straight quarters of increases. Total exports of goods rose $4.4 billion to $143.3 billion in the second quarter. Metal and non-metallic mineral products, led by precious metals, were up $1.4 billion. Motor vehicles and parts gained $1.3 billion on stronger exports of passenger cars and light trucks. Moderating these gains was a decline in exports of energy products of $0.7 billion, as lower crude petroleum prices more than offset higher volumes. Total imports of goods were up $7.7 billion to $148.5 billion in the second quarter, the largest quarterly growth in nine years. Gains were widespread throughout the commodity sections. Among the largest increases, consumer goods rose $1.2 billion on higher prices and motor vehicles products advanced $1.0 billion on record imports of parts. Since the beginning of the year, imports have grown by 9.0% and exports by 5.1%. The overall deficit on international trade in services narrowed $0.2 billion in the second quarter to $5.5 billion on a higher commercial services trade surplus. 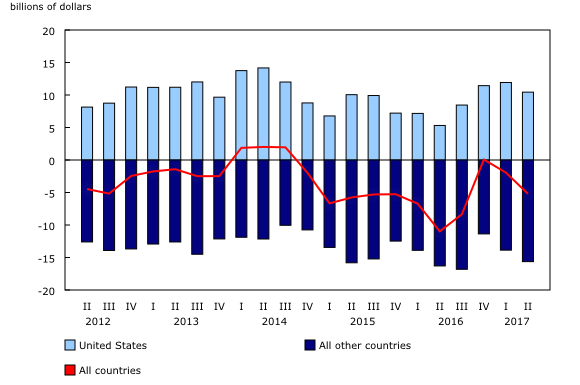 In the second quarter, imports of commercial services were down $0.1 billion, while exports edged up. The balances on other categories of services were unchanged from the first quarter. For transport services, receipts and payments both increased by $0.2 billion. Receipts and payments on travel services were both up slightly. There was lower spending by Canadians travelling to the United States in the quarter, but higher payments on visits to other countries. The investment income deficit, the difference between incomes generated on Canada's international financial assets and liabilities, grew $0.5 billion to $4.6 billion in the second quarter. Interest and dividend paid to non-residents on their holdings of Canadian securities were up $0.7 billion, led by higher payments on corporate bonds. There were also higher interest payments on loans and deposits held in Canada by non-residents. 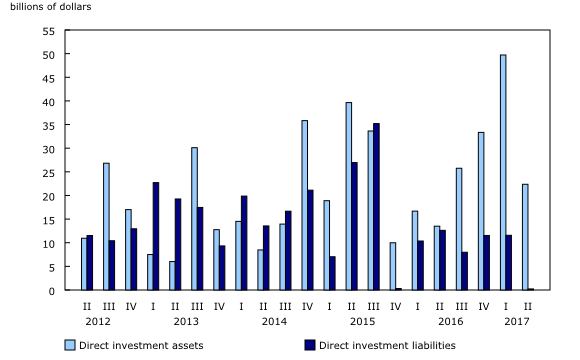 On the receipts side, profits earned by Canadian direct investors on their assets abroad were up $0.6 billion, moderating the overall increase in the investment income deficit in the quarter. Foreign investment in Canadian securities reached $39.1 billion in the second quarter, led by sizable foreign acquisitions of Canadian bonds. This investment activity followed record foreign investments in the first quarter. Non-resident investment in Canadian bonds was $31.2 billion, with more than half of the investment in private corporate bonds. Issuances of new Canadian bonds to non-resident investors to finance corporate acquisitions accounted for a significant portion of the activity. Record foreign acquisitions of provincial government bonds, largely new issues denominated in foreign currencies, also contributed to the inflow of funds in the quarter. Foreign investors added $7.6 billion of Canadian equities to their holdings in the second quarter, following a $38.0 billion investment in the first quarter. Canadian stock prices were down by 2.4% and the Canadian dollar appreciated by 1.9 US cents against its US counterpart in the quarter. Canadian investors acquired $7.5 billion of foreign securities in the second quarter, down from $31.8 billion in the first quarter. Canadians investors purchased foreign shares and reduced their holdings of foreign debt securities during the quarter. Purchases of foreign shares amounted to $7.9 billion, mainly acquisitions of non-US foreign shares. 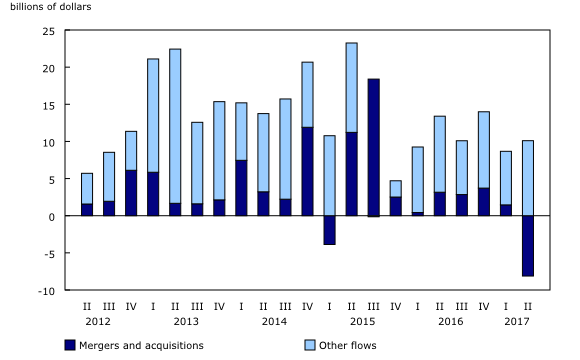 Acquisitions of foreign equities have totalled $34.1 billion since the beginning of the year, compared with sales of $1.8 billion for the two first quarters of 2016. Canadian holdings of foreign debt securities were down by $320 million, reflecting sales of US Treasury bonds, but acquisitions of US corporate instruments. Direct investment in Canada slowed to $223 million in the second quarter, its lowest level since the third quarter of 2010. Cross-border merger and acquisition transactions generated a reduction in foreign direct investment in Canada, as direct investors from abroad sold some of their assets back to Canadian investors in the quarter. Injection of capital in existing Canadian affiliates slightly offset this reduction. On a sector basis, there was an $11.1 billion divestment in the energy and mining industry. Investment activity in this sector has significantly slowed in the past two years. Direct investment abroad reached $22.4 billion in the second quarter, following a record outflow of funds of $49.7 billion in the first quarter. The investment was entirely in the form of equity instruments in foreign affiliates. About half of the direct investment abroad was related to merger and acquisition activities in the United States. On a sector basis, approximately two-thirds of the overall outward direct investment was in the finance and insurance industry. In the last year, direct investment abroad has exceeded direct investment in Canada by $99.9 billion, driven by strong outward and weak inward investment activity. Data on Canada's current account by geographic area are available from 1946. This information highlights the long-standing and important economic relationship between Canada and the United States. In 1946, less than half of Canada's current account receipts were from the United States, while nearly three-quarters of all payments went to that country. At the time, the greater importance of exporting activity with the United Kingdom explained much of the difference. Since 1946, the share of receipts from the United States have generally increased to account for over two-thirds of all receipts from abroad in 2016, with a peak of 78% observed at the end of the 20th century. In contrast, the share of payments made to the United States has generally declined to represent two-thirds of all international payments in 2016, reflecting the increased diversification of Canada's economic and financial partners. The balance of international payments covers all economic transactions between Canadian residents and non-residents in three accounts: the current account, the capital account and the financial account. The current account covers transactions in goods, services, compensation of employees, investment income and secondary income (current transfers). The current account data in this release are seasonally adjusted. For information on seasonal adjustment, see Seasonally adjusted data – Frequently asked questions. The capital account covers capital transfers and transactions in non-produced, non-financial assets. The financial account covers transactions in financial assets and liabilities. In principle, a net lending (+) / net borrowing (-) derived from the sum of the current and capital accounts corresponds to a net lending (+) / net borrowing (-) derived from the financial account. In practice, as data are compiled from multiple sources, this is rarely the case and gives rise to measurement error. The discrepancy (net errors and omissions) is the unobserved net inflow or outflow. For more information on the balance of payments, consult the Frequently asked questions section in the System of macroeconomic accounts module of our website. The module also presents the most recent balance of payments statistics. Real-time CANSIM table 376-8105 will be updated on September 5. For more information, consult the document, Real-time CANSIM tables. Balance of international payments data for the third quarter will be released on November 30. The updatedCanada and the World Statistics Hub – United States(Catalogue number13-609-X) is available online. This new product illustrates the nature and the extent of Canada's economic and financial relationship with the United States using interactive graphs and tables. This product provides an easy access to information on trade, investment, employment and travel, including merchandise trade by Canadian provinces and US states.